Mountain bike events can be a great way to ride a part of the countryside you wouldn't usually be able to access and provide an opportunity to meet like-minded people. Undertaking your first event may be a little daunting but rest assured there will be other first-timers and plenty of support on the day. Try to ride in different ways. Try to train in similar terrain and conditions to those which you will experience on the day. Get your bike in for a service at least a couple of weeks before the event to give time for any significant repairs. You do not require to spend all that practice with an avoidable gear failure on the day, and bike shops can't be expected to turn around a meaningful job with a couple of weeks notice. Ensure your bike is properly set-up for you. Bike shops or sports physios can help with this. Riding a poorly set-up bike at high intensity for an extended period will cause you back or leg problems that will take a while to recover. Start using energy bars and drinks (including recovery formula) during your training so that your body becomes used to them. Riding is a physically demanding sport because the body must be able to maneuver the bike over all types of terrain and, therefore, conditioning is vital to help maintain control of the bike and to prevent injury. For longer rides use a chamois cream or vaseline to reduce chafing. One of my friends goes by the "if it moves vas it!" Organise a great support crew to help you get ready, cheer like hell during the event and be there to help you recover at the end of the race. Get to the game early and go for a warm-up ride to get rid of nerves, stretch the legs and undertake final checks on the bike. Make sure you know the course and don't rely on those ahead of you to be taking the right turns. Another tip for new mountain bikers is to ride at your own pace and don't be tempted to blast after the pros off the start line. Start riding at low intensity, 2 or 3 times a week for 40 to 60 minutes. To increase your aerobic capacity, ride as hard as you possibly can for 3 to 4 minutes, then decrease to a slower pace without stopping. Recover and then repeat. 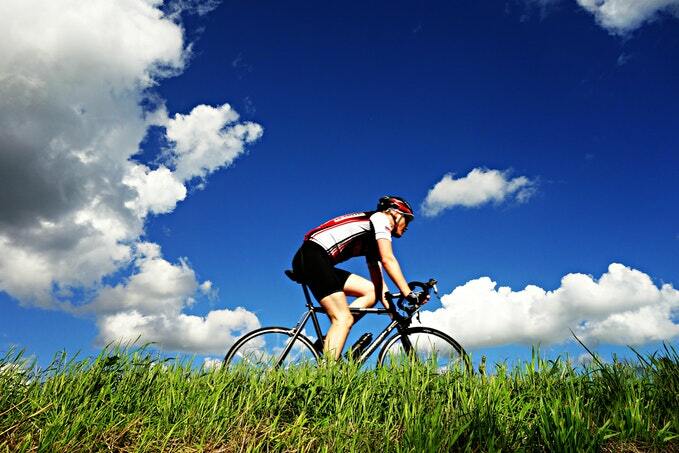 Cycling tips for beginners given above are fun, smile lots and banter with your fellow riders. You never speculate when you might want their help! Hitting the hills with a sturdy bike, a helmet, and other safety equipment will make your trek safe while providing a beneficial cardiovascular workout in the great outdoors.